The best of both worlds is right here. There are only good things to be said about the KMX Venom. 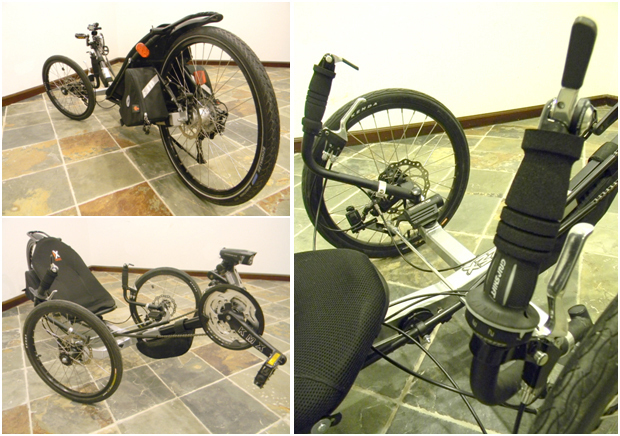 Some of them are seat attachment, boom design, and the hub mounting system. The frame is lightweight, strong, and sleek, and -best of all- this trike has options. The frame is TIG welded with square chromoly steel tubing and an aluminum boom. Weighing in at 7lbs the Venoms frame is the lightest in the 2011 KMX lineup. The aluminum boom helps reduce the weight and with its design it increases its strength and reduces twisting when pressure is applied. With the low center of gravity, high ground clearance, and frame strength you can take this trike just about anywhere. As I began my first ride on the Venom I noticed how light it was and how easy it was to maneuver. Hill climbing was easy with some effort and downhill was extremely smooth. The seat was very comfortable and crank position/height was perfect. With a few tweaks of my own it became a one of a kind hill climber, road racer, off road toy, and commuter. The hub assembly is simple yet superb. With the frame and hubs unique design the trike is almost certain to stay on your chosen path. A strong self centering steering system comes from the angles at which the hubs are mounted along with the design of the frame. If you ever got a little crazy and wanted to jump this trike, the hub would come out unscathed. The strength of its design will ensure that it never bends or breaks on you. After trying it out at the skate park for durability, I found that the KMX brand is a beast to be reckoned with. It has the strength to go all out after some simple modifications. 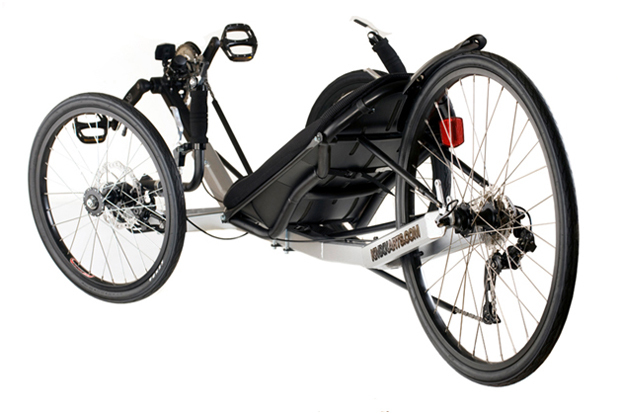 Like most trikes, the wheel slides right into place and with the quick release it can be attached or removed in just seconds. 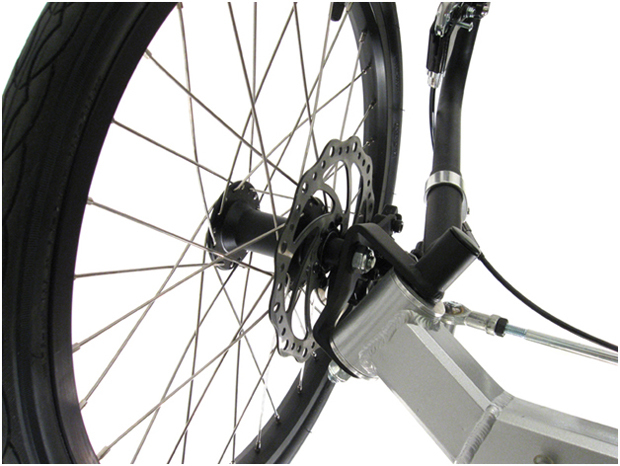 With the optional rear disk brake setup and cable guides, adding a rear brake is very simple and quick. The rear forks are just about perfect for any tire size or cassette range. 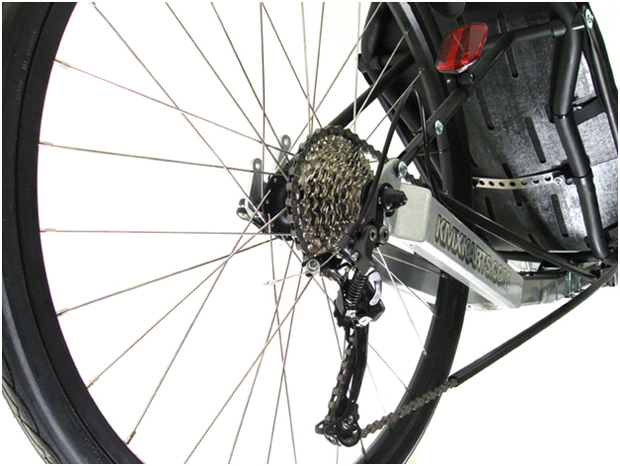 The derailleur system is simple and sweet. The quality is good and shifting is smooth. There is no need to upgrade ether of the derailleurs. When climbing a hill shifting is smooth with no challenge, and unnoticeable on the downhill run. After climbing the steepest hill in town I decided to add some more gears. I switched out the stock wheel and cassette with a dual drive, three internal gears and nine external gears. With a ridiculous 81 gears I was able to climb any hill I encountered with ease, at just about any low speed. With the same derailleurs I had the same great shifting experience as before, just with more options added in and was able to maintain that smoothness. Not to leave out that I didn�t have any shortage of gears on the way down. The boom is a great design; it�s durable and has minimal flexing. With the adjustability and derailleur post you can size the Venom to fit almost anyone and install many different gadgets. When I first put the Venom together I maxed out the distance from crank and seat, thinking I would be too tall for it as I am six foot six inches. Man, was I wrong! The KMX Venom could comfortably fit someone up to nearly seven feet tall. The seat can go really far back and the boom at its �MAX� mark was way too far out for me. Some people say the frame and boom are just rounded square tubing; this is not the case. The Venom has a custom extrusion for both the frame and the boom increasing its strength immensely. 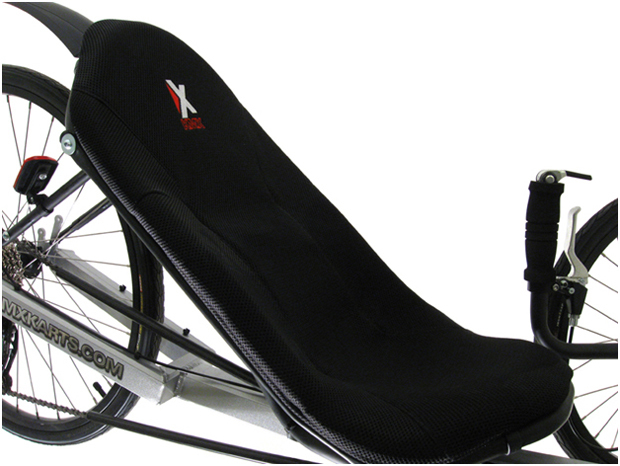 The new 2011 KMX seat is designed as a bucket seat and now instead of a hard back it has foam and a mesh cover. With the bucket seat design you will stay put rather than sliding when taking hard turns. The new 2011 sliding seat clamp system works like a charm. It�s much easier to adjust the seat back and forth now that you don�t have to completely remove the bolts. Instead simply loosen the bolts a bit and slide along a 14 inch section of the Venom's frame. 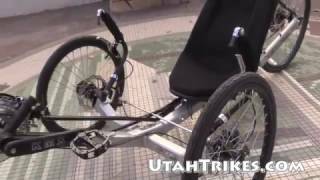 A quick release would be preferred and is on the list of items to be built in the Utah Trikes custom shop. We can�t forget about the seat stays that provide a range of five holes and four inches of adjustment to the top of the seat. Sit upright or lay back a bit. You can adjust the seat to fit your desired position. Good design, quick to adjust, and great leverage. The handle bars can be adjusted to lean in or out and can slide in and out of the mount on the hub. Setup with bar end shifters, foam grips, and brake levers for brake steering the Venom is very comfortable and easy to maneuver. With an added double-pull brake lever to control the front two brakes and a single lever for the rear, your control over the Venom increases when breaking. Building the 2011 KMX Venom was loads of fun, very easy, and self-explanatory. When I first took the Venom out of the box it looked like it was going to be complicated but, to my surprise, it wasn't. As I began to put things together, I rarely looked at the assembly instructions. When I did have to look, it was only to make sure I was still on the right track. I would have to say the hardest part of the building the Venom were the adjustments. For all bikes and trikes adjustments can be a real pain. Didn�t take more than about ten minutes to get it all adjusted, but as some people know, sometimes it just won�t set right unless you put the time into it. Customization is one of the best things about a trike. Building a trike is fun, riding a trike is a blast, but giving your trike a personality all its own is unique and can be incredibly fulfilling. Feel good about your personalized trike, and use it the way you want to. Through my own experience with the trikes I have ridden, I must admit that the KMX brand is in a class all its own. As I see it, a KMX is not a Jeep or luxurious Mercedes Benz but an SUV. With a KMX, going places can be easy and fun in sun, rain, or snow, on or off the road; it is rugged yet sleek, durable yet fast, sizeable yet compact. 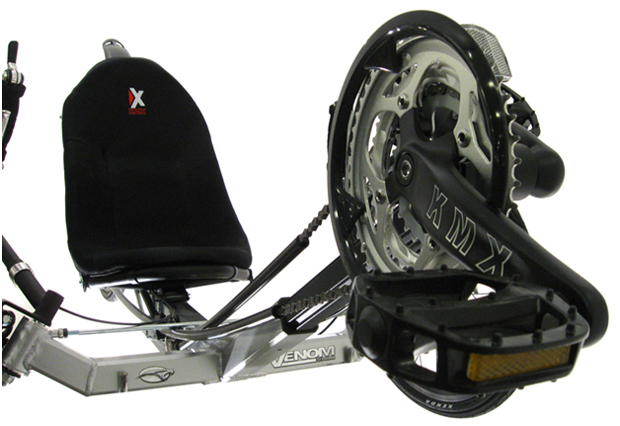 The 2011 KMX brand is my choice for a trike that can do it all within my means, and provide me with just about every option I seek. Print or Download this review here.